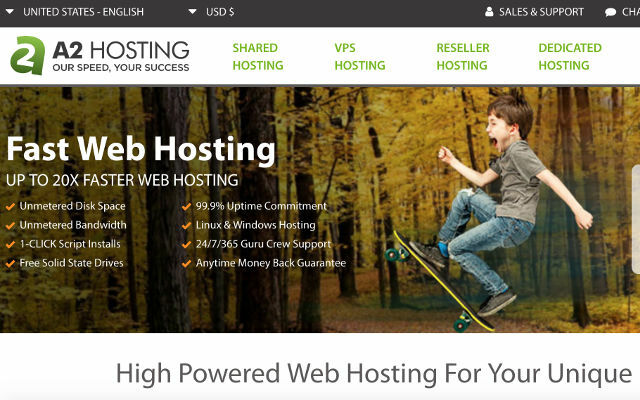 A2 Hosting Review | Is This The Hosting Service For Your Website? This article covers all the information regarding A2 shared hosting plans. We cover the plans, their features, client support and a few pros and cons before tying all these together in our final verdict. A2 Hosting is rated as our Best Performance Shared Hosting Provider. If you are looking for a host that will meet your speed and performance requirements, then A2 hosting is the company for you. The speed and performance that A2 brings to each of their packages has brought it to our #3 choice as the Best Host in terms of performance. What are the Pros & Cons of A2 hosting? Reliable uptime – ​​​​A2 comes in with a great uptime percentage of 99.92%. A reliable host with great uptime means that your website remains live with very little faults which can save you much money. Great speed – With their average page load times being less than 400ms, A2 ranks at the top-end in terms of load speeds. Your visitors will experience almost instant loading which adds to the pleasure of being on your website. HackScan – This useful security software provides protection against web attacks. A2 provides this software to their users for free. HackScan protects your site through 24/7 security monitoring, virus scanning as well as including a dual web hosting firewall. Site Migrations – A2 provides site migrations for free. As you may have realized after a few quick searches, not all web hosting companies provide a shift to their service without cost; sometimes this can cost a pretty penny, however, A2 has you covered by offering this service for free. Money back guarantee – A2 hosting allows for a 30 day money back guarantee. If for any reason you are not satisfied with their service, or would just like to test their service out, A2 hosting will give you 30 days in which to do so. Free CDN –A free Cloudflare account is included in each plan. Cloudflare provide a content delivery network service which basically allows files to be pulled from the server closest to the request. This shortened path allows for faster loading times. Green initiatives – A2 boasts at being a carbon neutral hosting company. By purchasing carbon offsets, which are units of green energy that is put back into the grid, companies are able to offset the amount of power they use to run their company. Price – A2 comes in slightly higher than their competitors, even on their most affordable plan. Of course we can apply the age old saying of, you get what you pay for; but it would be a good idea to compare their plans to competitors. Period – It is important to note that all plans are priced according to a 2 year contract. If you are looking to pay annually, then the price increases quite a bit. Limitations on the Lite plan – There are several features which are commonly included in entry level plans which A2 excludes. Features such as backups, spam filtering, a dedicated address as well as what they call “priority support” are all up-sells. What hosting plans and features does A2 hosting offer? A2 hosting offers three plans, the Lite, swift and turbo. In terms of shared hosting, A2 is priced at the top-end comparatively; their cheapest plan, the Lite plan starts at $7.99 per month, the swift at $9.99 per month and the turbo plan at $18.99 per month. With this added cost however, comes added speed and performance; A2 boast that their speed can be up to 20x faster than their competitors. What is A2 hosting's Customer Service like? A2 hosting does customer service right. They offer several support options, from telephone, to live chat, even Skype. Their support staff are also very clued up when it comes to solving problems fast and effectively. A2 support staff are also able to solve problems manually. This means that they are able to manually access your website and fix a problem, instead of talking you through the process. This is an excellent option for those that do not want to learn how to do the maintenance, but just want the problem solved. Some users enjoy solving their technical issues themselves, and for those users, A2 also has a self-help archive which covers most of the common issues. If you are looking for a web host which will provide speed and performance, then A2 will provide just that. With a great customer support as well as security, you can be sure your experience will be a good one. If the price is outside your budget, then one of their competitors such as SiteGround or InMotion will be a great alternative. But if you are really in need of great speed and performance, A2 will be a solution you won’t regret.